40 oz Wide Mouth is rated 4.6 out of 5 by 505. Rated 5 out of 5 by Ellie B from I love my hydro flask! I bought 2 a few months ago and I love them! I take at least one of them with me everywhere I go! It’s the best thing I’ve bought and I love it. Rated 5 out of 5 by Samantha186 from Keeps my water cold all day!! I bought this around a month and a half ago and it is doing me wonders. This size is great if you do sports because it holds a lot of water. This is also great for a cold day when you want coffee because it stays hot for a long time. Rated 5 out of 5 by MarFox from Love my Hydro Flask! I love everything about the Hydro Flask! It is definitely worth the money. Rated 5 out of 5 by KR13 from BETTER THAN EVER!!! Perfection in a bottle. Love the white and it’s perfect to carry around all day. Fantastic product. Daughter is seriously in love. Rated 5 out of 5 by Nguyenk9 from Cute and functional I’m super happy with my purchase. The color in real life is a bit more blue but i love it nonetheless. I definitely will get a larger bottle next time! Rated 5 out of 5 by Kevin1222 from BEST BOTTLE EVER I had bought this bottle not too long ago, and I am absolutely astonished by the great quality of the product. My drinks stay cold for minimum of 16 hours, and it keeps my drinks warm for the standard time! I recommend this product to all! Rated 5 out of 5 by mjaaaaaayy from love my hydro!! THIS IS THE BEST PURCHASE I HAVE EVER MADE! MY WATER STAYS COLD ALL DAY AND I HARDLY HAVE TO REFILL IT! Rated 5 out of 5 by MegW3 from My New Best Friend I bought my HydroFlask (40oz w/ lid/straw) about a month ago, and it has changed my LIFE!! I would always bring a plastic water bottle with me everywhere I went. It would get warm very quick, and would make me guilty for the negative impact it had on the environment. Also, I was not drinking enough water!! Since using my Hydro, I have been drinking so much more water, and I feel good knowing I am not wasting anything! (In all seriousness, it is a great accessory too) Invest in a Hydroflask! It is absolutely amazing!! Rated 5 out of 5 by chihirouwu from clock it the house girl I have been contemplating for a whole year about buying this water bottle, one was because it was out of my budget, and also because my friend had one and brought it while we went to the beach and she told me that her water has been that cold all day (it also had ice in it and we went to the beach towards the end of out day). So I bit the bullet and finally bought one, and I don't regret it one bit. First off, I got the lilac color with the mint straw lid (It looks actually beautiful haha). It has kept my water ICE cold all day, and I have already drank more water than usual. I put my ice and water in it at the beginning of the day, and by the time i drank all my water (over a 6 hour period) there was still ice left in it (which never happens when i do this at work with my usual water bottle). Y'all, get this bottle, you wont regret it. Rated 5 out of 5 by ToothTina from Slightly more pink in perfect but cute My favorite color is lavender and on the site the bottle looked a little more purple. In person, it has more of a pinkish tone, but I still think it's lovely. Rated 5 out of 5 by Loree from Best way to drink my H2O I love this bottle I love my water ice cold and this keeps it cold (Ice still in tack) next morning! Rated 5 out of 5 by CincyRando18 from Exactly what I wanted Some people may think this is too much for a water bottle, but if you are like me and you use your water bottle daily and are drinking upwards of a gallon a day, then this will be an amazing long time investment for you. 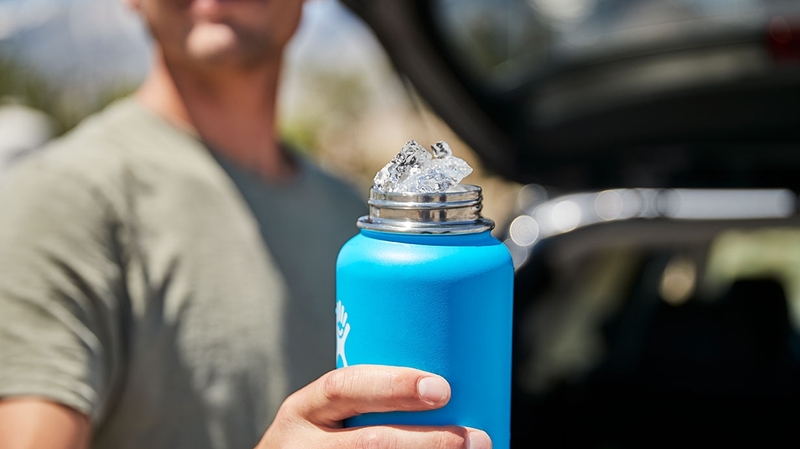 It will keep your water at close to whatever temperature it was when you put it in all day and the durability is amazing. The other thing is that if you accidentally get a dent in it or anything, it just adds character and it still works exactly as well as it did before. This is a great product for which you get exactly what you paid for. Rated 5 out of 5 by Troydude from Great Quality I have used Hydro Flask for years and I think they are the best out there. I recently purchased a replacement for my old flask that started having some issues and the new bottle is awesome. Rated 5 out of 5 by Phenelope26 from Convenient For the price they are so worth it. They can keep ice in them all day!! Rated 5 out of 5 by Bryp from My non-negotiable It's my non-negotiable for ensuring I stay hydrated on not just adventures but day to day life. I literally take a hydroflask everywhere. They keep everything freezing or boiling for the entire day so coffee and cold water come everywhere in my 40 and 24 oz flasks. I recommend the drinking spout for the water as I've had so many occasions where it's spilled down my front whilst drinking in a moving vehicle! Rated 5 out of 5 by abbys from Love it! I saw this color and immediately had to buy it! So cute! I’ve bought several hydroflasks in the past and will keep buying them! Rated 5 out of 5 by cdem0318 from Amazing product! I bought this product after hearing a lot of good reviews from friends. I am so happy I got this size because I drink so much water a day. I love the wide mouth because you can easily put ice/lemon the water bottle and the mouth is big enough to add either in. Very nice color and material. I bought the boot to complete the look and the straw cap for less spillage. Very nice!! Can the flask go in the freezer to chill prior to beverage addition? We don't recommend putting the flask in the freezer because it could effect the insulating properties of the flask. Why am I hearing from people about a sale with reduced prices on the 40 oz wide mouth for $25, yet it's not reflected on your website? Making it hard for me to become a new customer. That sounds like a counterfeit issue. We were running a sale on our discontinued colors, but it was only for 25% off. Those prices showed in the cart. How well do stickers stick to it? Everyone likes loading their bottle up with stickers. Stickers should stick fine. We have a lot of customers who put stickers on their flasks. Yes, that should be fine! We would just suggest taking extra care with cleaning after putting anything besides water in the flask. How high and wide is the 32 oz and 40 oz? I'm trying to decide which best suits my needs. Thank you. Is this bottle compatible with the wide mouth straw lid? Yes, the straw cap will fit the 40 oz flask. Can I purchase the 40 oz in sage? We do not have any in stock and this flask is being discontinued. Is there any difference in the heat retention of the powder-coated flasks vs. the uncoated stainless finish? No, the only difference is the color.